OK but no more than that. The ale selection is good and largely Scottish but a preponderance of middle aged blokes on their own of a bank holiday Monday does not an exciting welcome make. A pint of Dark Moor Mild from the Kelburn Brewing Company was in good nick. One punter was 9/10ths of the way through Middlemarch. Just been in for a pint of the 10% Thomas Sykes Old Ale, from Burton Bridge. Any more of that and it will be a Happy New Year, what I remember of it. Terrific find. Row of handpumps, all with interesting beers. 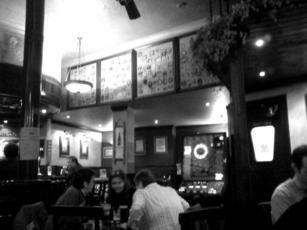 The pub was very busy for a Monday night, so godk nows what it is like at weekends! 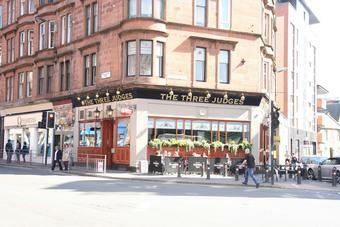 Take the subway to Kelvinhall - cross the road and go into the Three Judges. That's all I need to say! Pretty decent despite a rather bland interior. Lots of choice, with plenty of beers hailing from the north of the border, as they should.